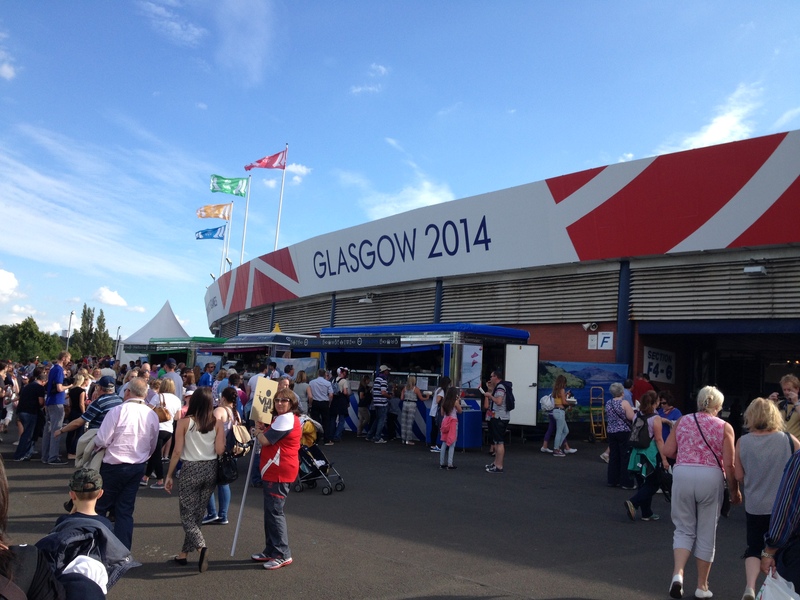 Another fantastic evening’s sport at the Commonwealth Games was had at Hampden Park on Monday evening. I had been excited about this evening since receiving the email from Glasgow 2014 to confirm that I would indeed be in Hampden for the mens’ 100m final. There might be no Usain Bolt or Yohan Blake, but that event is always one of the highlights of any athletics programme. I couldn’t wait. As for Hampden itself, it looks absolutely glorious as an athletics stadium. It is no longer ideal for football with its shallowly sloping stands and huge playing surface – to me it looked absolutely ideal for athletics. No doubt it will be converted back into a football stadium after these games as planned. For the track to remain and this facility to stay in place would be fantastic and potentially provide the kind of “legacy” that is often talked about. Our seats were a lot better than those ones I was complaining about at Ibrox in a previous post, about 20 rows back at the opening bend with bags of legroom. They were also in the aisle, which meant easy access for a few cheeky bottles of Heineken through the evening. The action itself was also excellent. The undoubted highlight of the evening was Libby Clegg’s gold medal in the womens’ T11/12 100m (for blind or partially sighted athletes), the Scot winning by more than a second, something of a chasm in sprinting terms. The subsequent singing of “Flower of Scotland” was also pretty special. 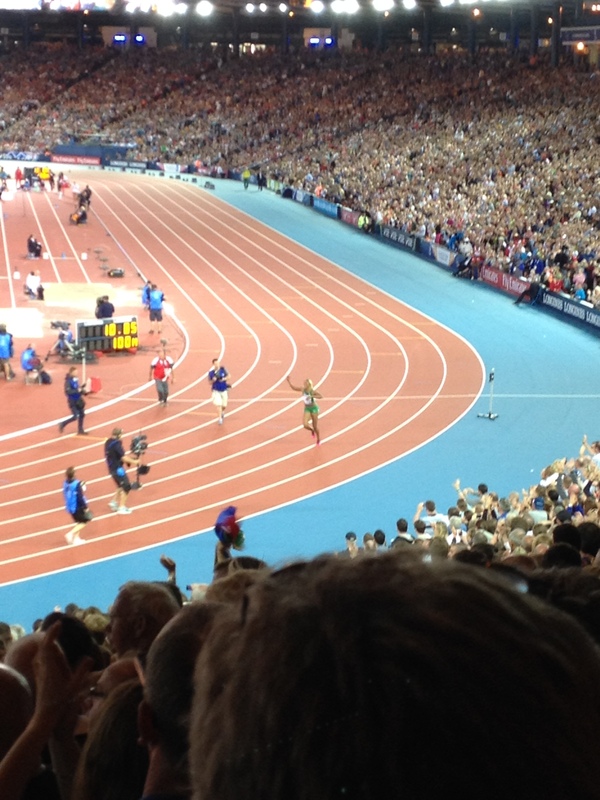 In the end the womens’ 100m final, despite my previous eagerness, was probably the more world-class event than the mens’. Blessing Okagbare of Nigeria stormed through to win with a rather good time of 10.85, a new Games record. In the mens’ race, Jamaican Kemar Bailey-Cole snatched gold from England’s Adam Gemili, Bailey-Cole winning with a time of ten seconds dead. Gemili was given a raucous welcome and support from the crowd, but it wasn’t quite enough for him to take first. 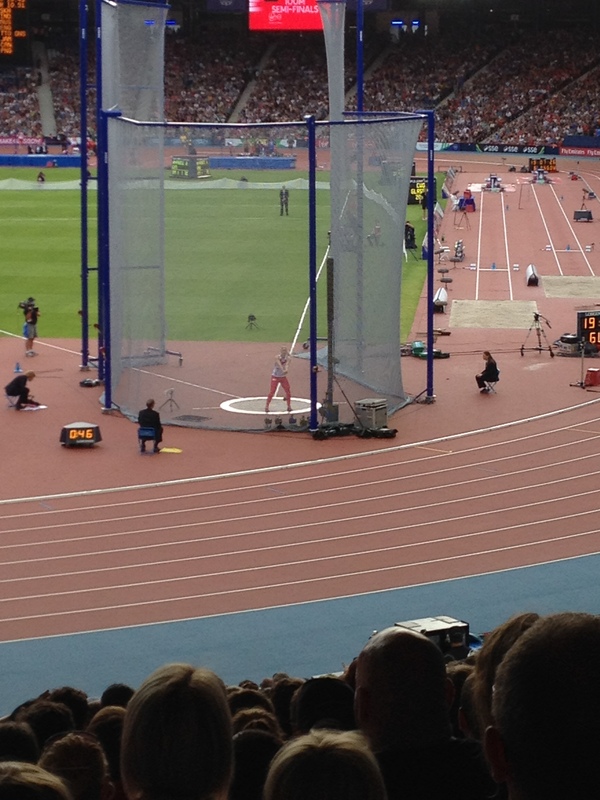 The other stand out event of the evening, for me, was the womens’ hammer throw. The fantastically named Sultana Frizell won that with a throw of 71.97m. Although a long way short of the World Record in the event, it was clear that Frizell was the closest to a good-standard athlete in that field; she also broke the Games Record. The Hampden crowd was also fantastic. 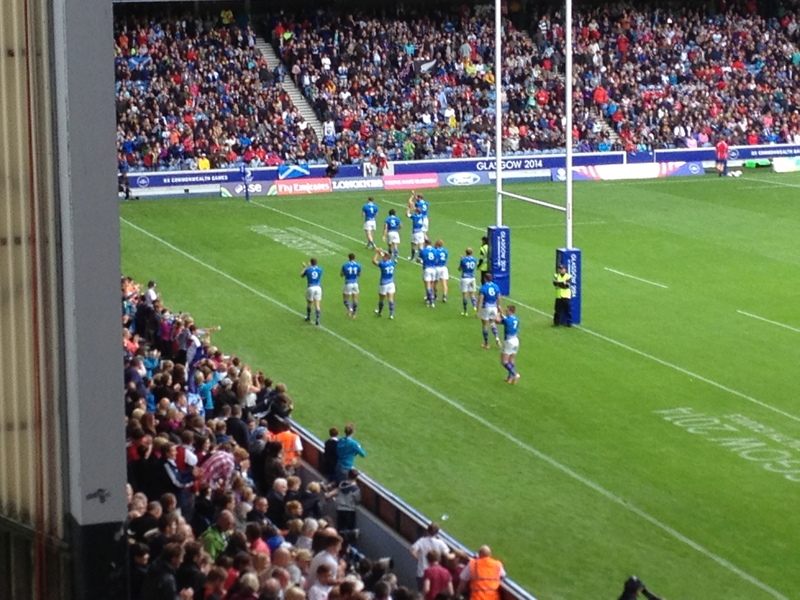 Clearly the Scots on the track or in the field were given the greatest ovation. 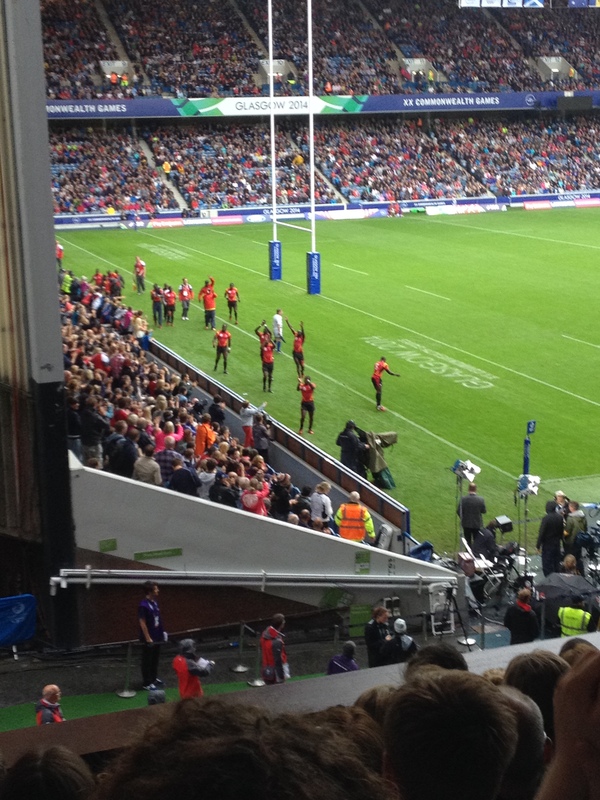 Indeed, any home nations athlete, be they from England, Wales, Northern Ireland or Jersey, were given a similarly loud welcome by the crowd. 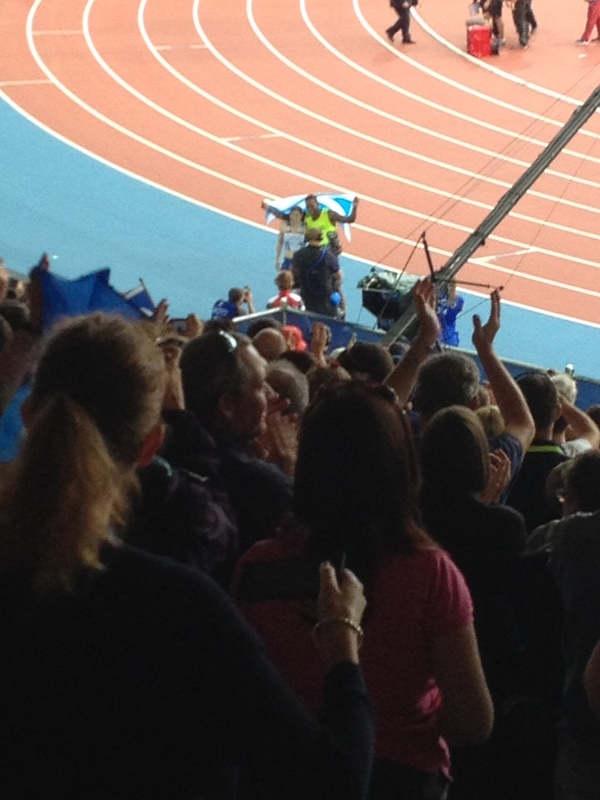 The “Hampden Roar” was back, but for folk running round an athletics track rather than for football. 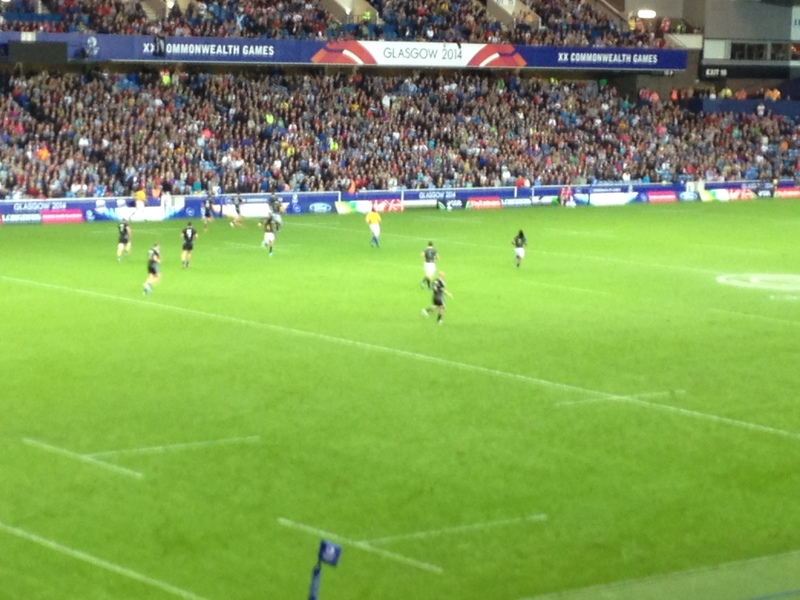 As well as those from the home nations, though, every athlete was given their due and, as with the Rugby, the crowd was also able to pick a favourite or two for the evening. For this Monday night it was undoubtedly Grenada’s Kurt Felix in the Decathlon, who was far and away the best high-jumper in the field to the point that his 400m heat had to be swapped so he could warm down. When he cleared 2.12m, 44,000 folk in the Southside of Glasgow belted out their approval. 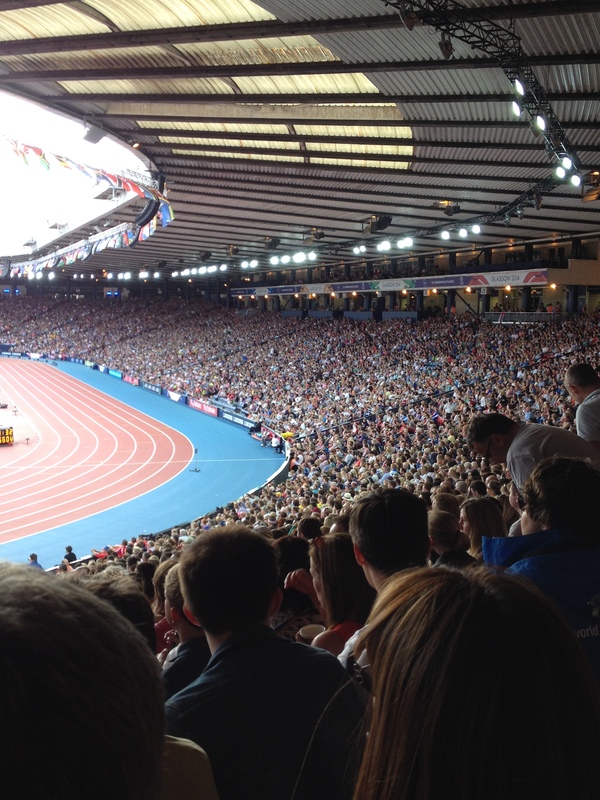 The evening ended then with the thought of what Hampden could be in the future if the SFA dared to move away and take the national football side round Scotland instead, and indeed if Glasgow put in a bid for the 2021 World Athletics Championship. What we had certainly witnessed was a wonderful evening of sport, in a great venue, in what seems to be the ideal city for these Games. For the second day of competition at the 20th Commonwealth Games, I took a trip to Scotstoun for some world-class squash action. 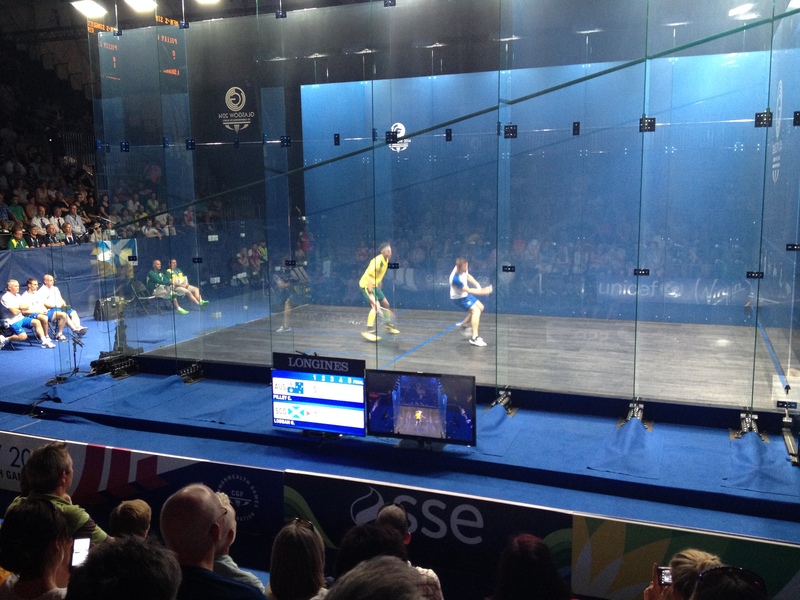 Squash is not yet an Olympic sport – that makes the Commonwealth Games, along with the World Open (effectively the sport’s world championships), the most high-profile squash event going. After a very pleasant walk down from Scotstounhill station, with a smattering of jovial volunteers showing me the way to go, I found a seat at Scotstoun Sports Complex and got set for four hours of utterly engrossing sport. 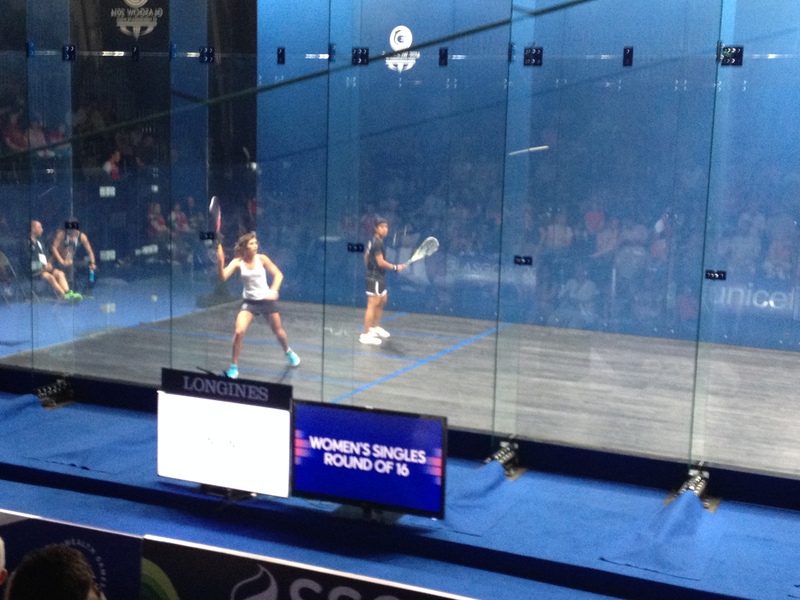 First up were New Zealander Joelle King and Joshna Chinappa from India in the women’s singles. Despite a good fight from the Indian player against her more highly ranked opponent, King came through in the end to win by three games to one. As the underdog, the crowd got right behind Chinappa, with one particularly enthusiastic spectator’s cries of “come on Chinappa!” heard pretty much on every point as the match reached its conclusion. Despite the Glasgow masses being with her opponent, King, the 3rd seed, triumphed 11-3 11-8 8-11 11-5. Up next it was Megan Craig, again from New Zealand, playing world number 1 Nicol David of Malaysia. David had been top of the rankings for 99 weeks and it showed as she clinically dispatched of 21-year-old Craig in three games, with the Malaysian displaying some magnificent touches. David won through 11-7 11-6 11-5, and she was the first of two number one seeds playing that afternoon. 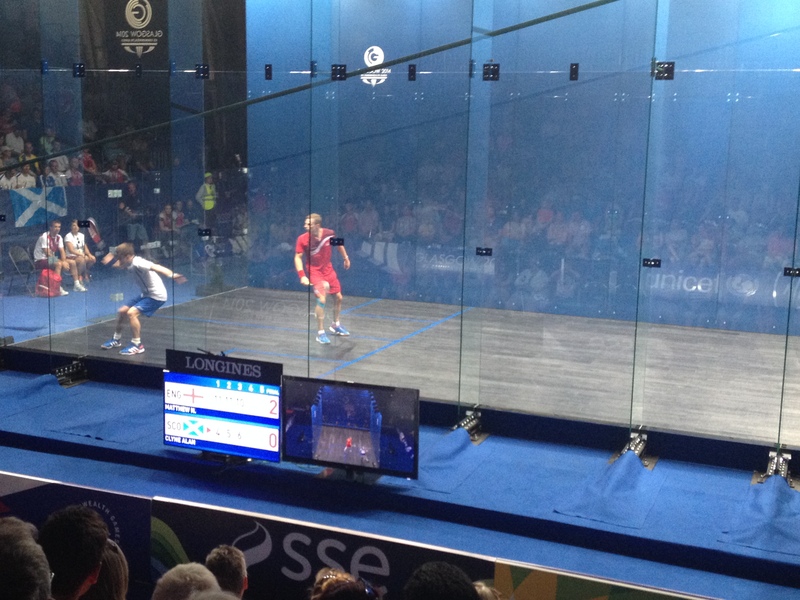 The second came in the third match of the day in the form of Englishman and reigning World Open Champion Nick Matthew. His opponent was Scottish number 1 and occasional reader of this blog, Munlochy’s Alan Clyne. Bizarrely, it was both players’ birthday so they both got a raucous “happy birthday” shout from the crowd before proceedings began. 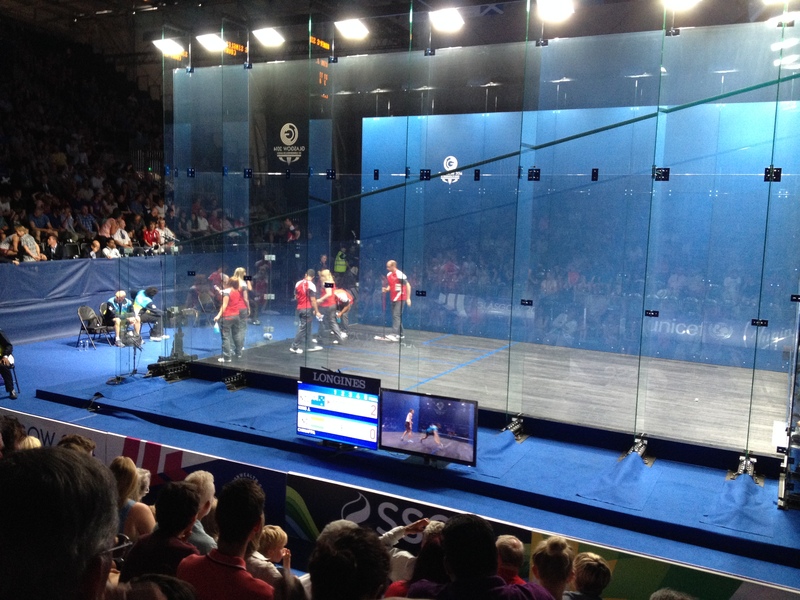 This match was undoubtedly the main event for the 2,000 or so people seated round the show court, the Scottish crowd being particularly enamoured with the game of squash after Clyne’s incredible two hour slog the night before to come through and beat India’s Harinder Pal Sandhu. In the first two games, Matthew was utterly clinical against his Scottish opponent and despite some fantastically partisan home support, the Englishman won 11-4 and 11-5 respectively. In the third game, Clyne, the number 9 seed, really came into the match, grittily pulling a 4-10 deficit back to 8-10 despite every point being the match ball, before Matthew eventually clinched victory 11-8. It was another fantastic match and the crowd acknowledged both players well at the close, with Alan giving out a few autographs to some appreciative young squash fans as he and coach Roger Flynn dissected the match in its immediate aftermath. 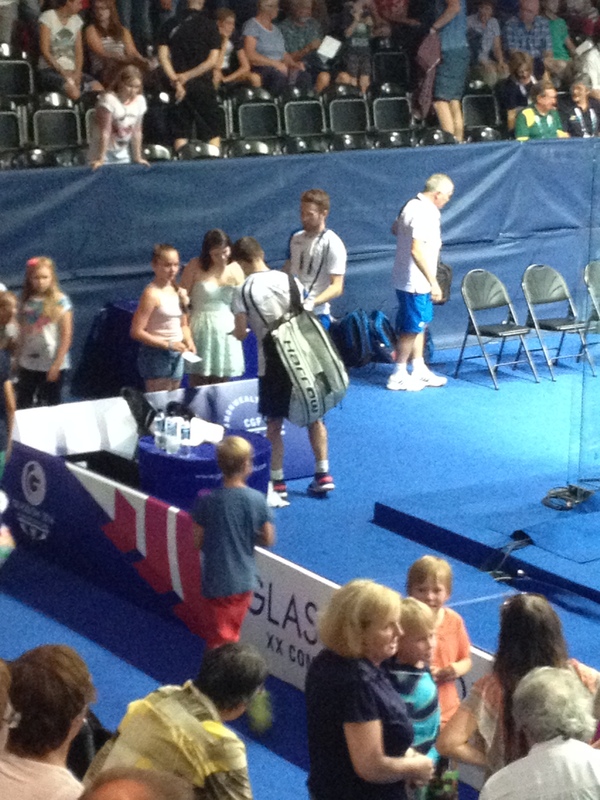 The final match saw Clyne’s fellow Invernesian Greg Lobban play Australian number 5 seed Cameron Pilley. The announcer gave the crowd the lovely pre match stat that Pilley had the fastest hit of any man on the PSA World Tour, clocking 176mph. Lobban, the Scottish number 2 and 16th seed, seemed to have the measure of his Aussie opponent in the opening few points but Pilley pulled away to take the first game 11-6. The following game saw Pilley demonstrate his class winning 11-4. In the third, again the young Scot seemed to have the measure of his opponent initially but the more experienced Pilley again fought back and won through 11-6. I did like the fact that at one point, when Lobban threw his racket onto the court floor out of frustration with himself, he was instantly given a conduct warning. Squash umpires do not take that kind of thing lightly, it would appear, unlike their tennis-officiating cousins sometimes do. With the end of Lobban v Pilley came the end of a great 4 hours of sport. Squash is strangely mesmerising, the long rallies raising the tension as you wonder which player is going to break the other down or find that impossible angle, as Matthew and David managed on a few occasions, and take the point away. What is particularly unclear to me, after yesterday’s wonderful action, is why squash is not an Olympic sport. The arguments for it being one are easy. A squash Olympic gold medal would be the pinnacle of achievement in the sport. 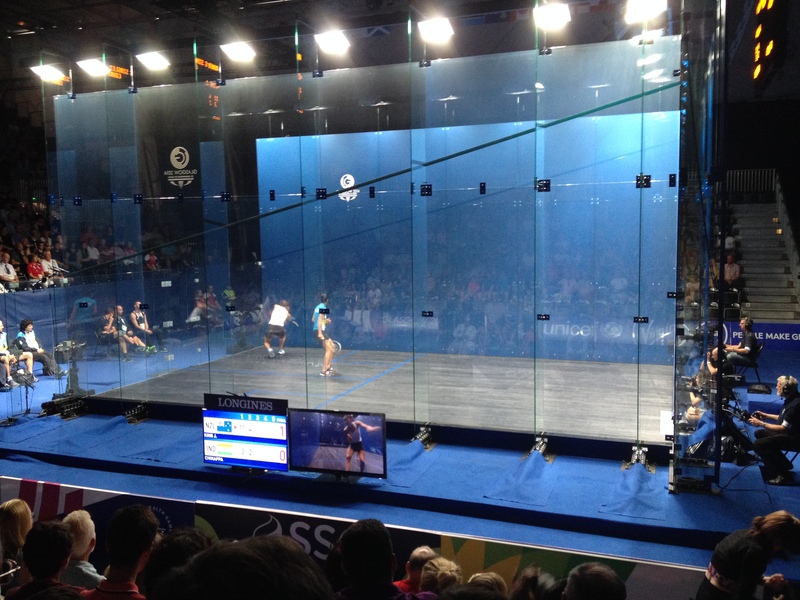 Squash lends itself easily to spectating, both live and on television. And, more fundamentally, despite being a complete novice who understands only about 60% of the rules, squash is utterly gripping and clearly requires supreme fitness and mental strength which any knowledgable sporting crowd respects. What more do the IOC need, I ask you. Squash’s next shot at being an Olympic sport comes in 2024 – it absolutely deserves to be on the list. 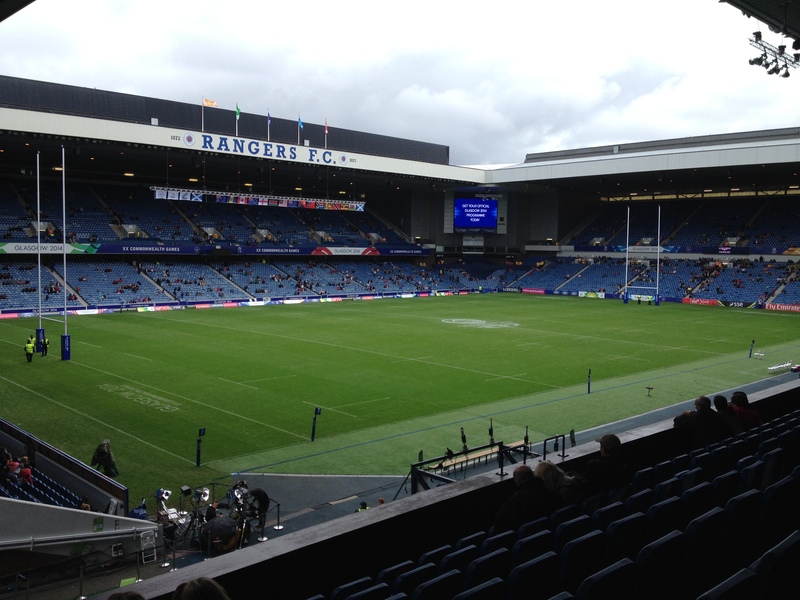 As for me, it’s the Rugby Sevens medal matches tomorrow evening at Ibrox. To go into that stadium with an entirely friendly crowd in attendance will be quite something.